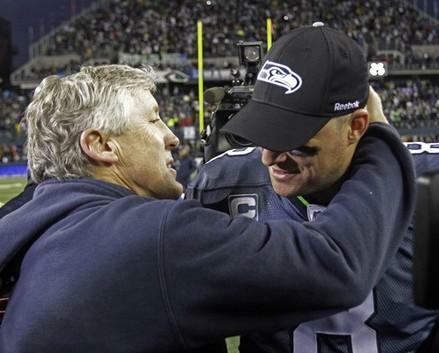 Seahawks quarterback Matt Hasselbeck gets a hug from coach Pete Carroll after the team beat the Saints in the NFC Wildcard playoff Jan. 8, 2011. With Hasselbeck now a free agent, will the Hawks open their arms to another quarterback in the upcoming draft? Will Locker Go from Husky to Hawk? 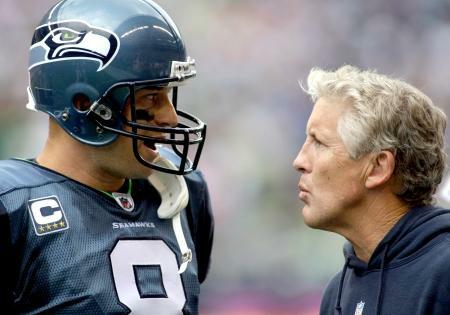 The Seahawks were unable to agree on a new contract with quarterback Matt Hasselbeck before the lockout, which made him a free agent. Unsure of whether they'll be able to ultimately sign him, there's talk that the Hawks might be interested in University of Washington star quarterback Jake Locker. Art says that's a bad idea. "It's way too much pressure on the college hometown hero to come in and try to be the savior for the pro team in the same town. That's just foolish." Right now, the Seahawks have the 25th pick in the first round of the draft. General manager John Schnieder has said he's willing to trade down to the 30th pick or even lower to a team that would give them more 2nd, 3rd and 4th round draft picks. The goal is to get more rookie players who could start right away. That's because the lockout has so far prevented the typical veteran free agency period this year. Art says the Seahawks have immediate needs on the offensive line, at cornerback and at safety. There's a possibility that the Hawks could use their draft picks on other positions and try to trade for a veteran quarterback later - if a deal with Hasselbeck isn't worked out. For example, Art says Bengals quarterback Carson Palmer, who used to play at USC with current Seahawks head coach Pete Carroll, is reportedly unhappy in Cincinnati. Some progress was reported after the latest round of intense mediation. The two sides have been given some time off and will resume negotiations May 16th. Before that, a federal judge is expected to rule on an injunction by the players' union that claims the lockout is illegal. Art says, according to legal experts, the union has a good case. If the judge grants the injunction, it would stop the lockout and resume play under the old collective bargaining agreement while negotiations continue. "So, from the fans' perspective, this could come down to a legal decision that creates a 2011 season."